Image above from Bromley by Bow Centre. The Collection 2018 is at Bromley by Bow Centre, St Leonards Street, London, E3 3BT. If you would like a low cost stall to sell handmade or vintage products email Jamiuel at connectionzone@bbbc.org.uk. Four Corners have got a project up and running which explores Aldgate East, Whitechapel and Spitalfields past and present. The exhibition starts on 4th Dec at Whitechapel Idea Store, and you are invited to the following events, also at Whitechapel Idea Store, London, E1 1BU. Aldgate East My Neighbourhood exhibition: launch on 4 December 2019, 6.00-8.00pm at Idea Store Whitechapel. Book your place for the launch here! The Gruffalo, based on the classic picture book by Julia Donaldson and Axel Scheffler is now on at Stratford Circus Arts Centre until 28th Dec. The show last an hour. Booking and more info here. This free concert includes music by Boris Ord, William Walton, J S Bach, Richard Rodney Bennett, William Byrd, Michael Head, Franz Grüber, P I Tchaikovsky, Felix Bernard, J Pierpoint, and arrangements by their Musical Director, Jonathan Rathbone. 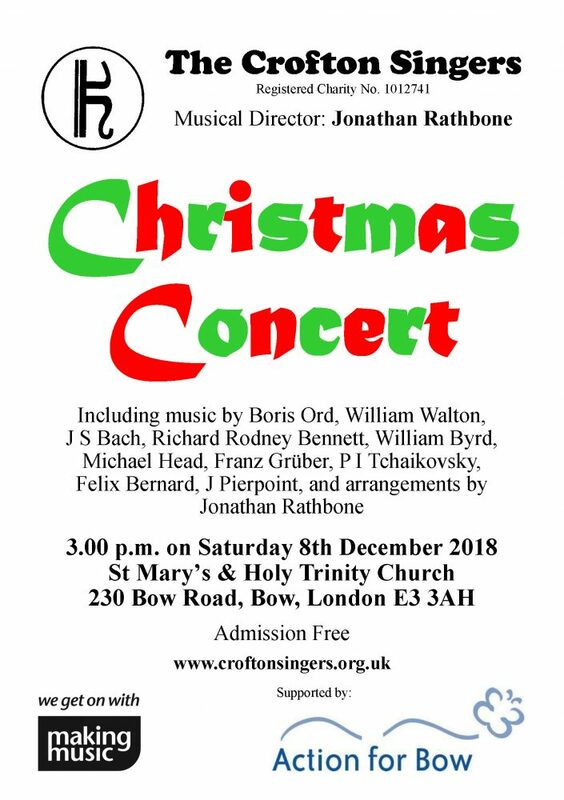 The concert is at 3pm on Saturday 8th Dec at St Mary’s & Holy Trinity Church, 230 Bow Road, London, E3 3AH.